Today is #GivingTuesday, and thanks to some very generous members, every dollar you donate to Breast Cancer Action will be matched up to $20,000. Donate now to double the impact of your gift. At Breast Cancer Action, we aren’t in the pocket of any industry. We are fiercely independent and you can always count on us to be an outspoken and fearless watchdog for women’s health. Your donation today is an investment in social change we’ll all benefit from. 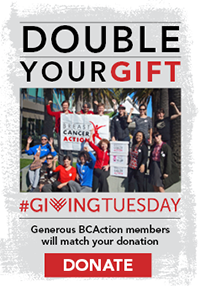 Committed BCAction members will match every dollar you donate today up to $20,000. Donate right now so your gift will have double the impact. Thank you so much for supporting our work to achieve health justice for all women at risk of and living with breast cancer.